Brad adds a wine nook in his Expedit. Enough to stash away a few bottles of red and wine as well as glasses. Just a note that I did this just by trimming the bottom off the Hatten about .25-.5 inch from the bottom level with a hack saw. I will every once in a while by a bottle of wine that is too wide for the top level, but standard size bottles fit up there and the wider ones can fit on another level, so it’s never been a problem. So you can still make it work even if you don’t want to take it apart and drill new holes! Thanks for that. Mine was fixed today. Good Job! The night I went to pick up the parts, I noticed how square this Hutten wine storage rack was and I had this same idea. Thank you for posting it so I could verify that it’s been done before. I sawed off from the four vertical pieces by measuring 3/8″ from the top, then lining all four up in my miter box, sawing all four at once. It fits snugly this way, so it won’t shift around. Then, I drilled the first hole at the bottom. If you want even spacing and enough room for nine bottles, I drilled the new holes 4.5″ apart from each other. That’s the original spacing, just shifted down. You’ll have to do this to all four vertical pieces. It was very easy and fun. Thanks Brad and IKEAHackers.net for the post. I looked at that wine rack in store sooo many times, wondering if it would fit. One day I took the demo from the market place to the warehouse to see if it would. Imagine that – Perfect Fit…. When I came across your hack, I though great minds think alike. I used your instructions to hack mine! Thanks for the idea. We made two tonight, although we fought a little to get the screws in tight enough to fit width-wise. Make sure to drill large enough holes! thank you for that great hint – we extended the Expedit in our kitchen that way. where did you get the stemware racks? i have just found this great website. cool hack, i just did exactly the same thing a few months ago! dont paint it black, you should paint it in some other color to match your decor in that area. I should have sent this in. 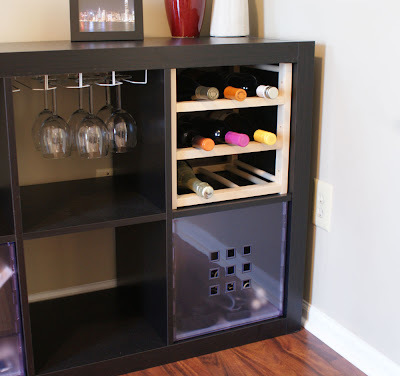 I did the expedit bar hack a few months ago and put that same wine rack in mine. I did the exact same thing and spray painted it black. I also used the same wine glass rack, and also painted it black. Great minds think alike! what is this neat mounting for the wine glasses!? The wine glasses are held by metal wine racks that you can buy at IKEA. They actually aren’t on the website, but they are really cheap. I also did this hack, and the racks screw in easily to the expedit. The screws just don’t come with the racks, but simple screws did the job! I actually didn’t paint mine but put them far enough back to where you can’t see them. but the glasses are still close to the edge. Oh, I like this a lot. The wine glass rack especially is a good addition. IMVVVVVO, though, there is something a bit too “clashy” about having the three different elements all right next to each other: the basket, the glass rack and the bottle rack. But obviously many others prefer it and perhaps I am too drawn to repetitive patterns! don’t listen to these ppl who want you to paint it. it looks fantastic as is!! painting it “to match” would make it look dull and boring. it’s perfect. 🙂 great hack!!! the contrast is great! You should paint the Hutten in white or better in Wenge color. I think if you bought the drawers instead of the bin it would look better. I love the idea though… I’m an Expedit nut. I agree that it would look better painted. Great hack though! Now THAT is classy. I love it! Neat hack! I think it would be more awesome if the creator had painted it to match as he first intended – that, or spray painted it a nice bright deliberately saturated color..it still kind of looks unfinished with the raw wood.